The Grant Enhancement Training (GET) Workshop is conducted by scientific development, clinical operations, study budgeting experts of SCRI. This one-day workshop aims to help individuals develop competitive grant applications by facilitating early engagement and collaboration between investigators and SCRI experts, and by providing hands-on guidance in the preparation of a grant. 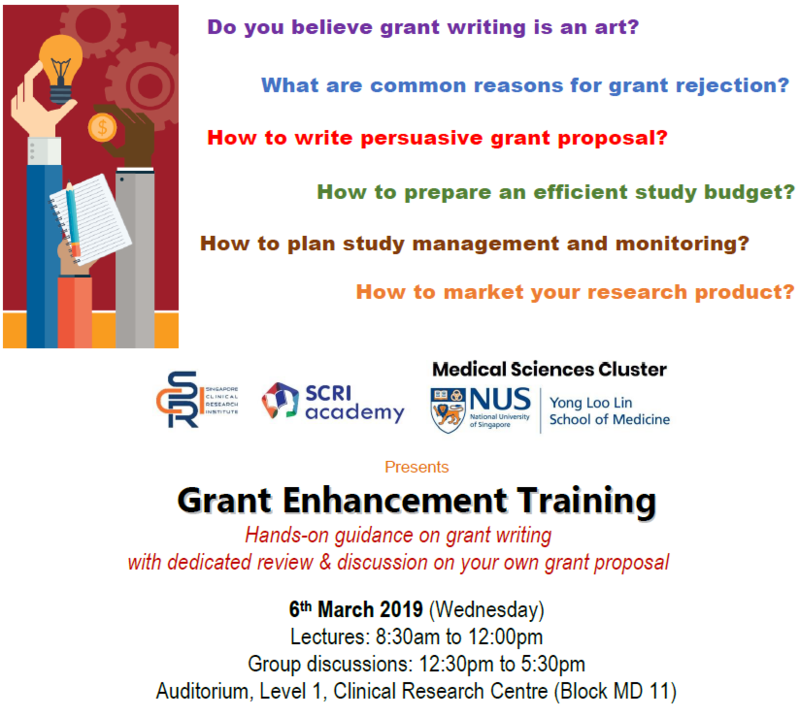 The workshop will detail how best to present the key elements of the grant. An optional component of the workshop is the dedicated review and discussion of each participant’s proposal. After the workshop, participants would be better equipped to write a persuasive, high impact research proposal for the next grant call. For registration, please complete the online Registration Form. Participation in the workshop is FREE and the number of spaces is limited. Preference will be given to participants attending both lectures and group discussion. Participation in the group discussion will not be permitted without a draft grant proposal submission. If you are keen to participate in the group discussions, please submit your CV and research proposal draft (using the NMRC research proposal format) to nbox before 5pm on 20 Feb 2019. Participation in the workshop will be confirmed by 27 Feb 2019. Do visit http://nusmedicine.nus.edu.sg/medical-sciences-cluster/ for more details on the workshop or drop us an email (medbx112@nus.edu.sg) if you have any queries.